Japanese people are pretty much built from the ground up on rice. They might eat it three times a day. They drink it in the form of the alcohol sake at parties, and end of year parties; for ceremonies like weddings, funerals, and engagements. The very origin of Shinto, and all of its symbols are related to humble rice. The very architecture of Shinto shrines, throughout Japan, is based upon early rice storage buildings in the pre-Shinto era a little more than two-thousand years ago. It is said that rice and sake play a central role in secret Shinto ceremonies that involve popular festivals, and even the emperor and his family. It’s perhaps not inaccurate to say that Japan, and the Japanese people, were built on rice. I’ve now had the Minolta 50mm lens for about a year, and there’s been no looking back. It’s a special lens, and a dear piece of photographic equipment. You might be wondering why I should celebrate a lens. I think it’s true for all industries, that there is the one thing, the one piece of work equipment that is held dear to us. It somehow acquires legendary status. The 50mm lens for the photographer was, at one time, the main lens, ‘the standard lens’ as it was also called. 50mm is not just a nice round number, it was a nice all-rounder. It was great for photojournalism, for portraiture, landscape, street candid, whatever, it was there and it was good. All manufacturers endeavour to make the best lenses as possible. Generally, Lieca and Minolta (now Sony) have the best lenses. However, according to DPReview, the Pentax 50mm was the pick of the bunch, with the Sony / Minolta 50mm 1.4 snapping on it’s heels. Embarrassingly, the Canon 50mm was the dunce of the class (as is most Canon lenses, anyway 😉 ). The design of the Sony 50mm 1.4 lens still shares much of the same design as the original 1985 Minolta 50mm 1.4 release (which is the lens that I have and am raving about), when Minolta first launched its Auto Focus series of lenses. Which, itself, was based on designs going back to the 1960’s Minolta MC and 1970’s MD mount lenses. In terms of image quality it’s still awesome; portability: it’s small, and not heavy at all; so it’s still hard to beat. It’s hard to improve on such a great lens; the best you can do is to tweak a winning design. Phew! What a day. I felt like I was in the army today, “hurry up and wait”, and a lot of standing. As I type this, I’m cooling off with a can of Suntory Premium beer. It was the sort of day that was the end of spring, but people’s wardrobes had not kept up. There was a guy who chose to wear a knitted beanie; I’m sure you could call it a ‘seasonal-wardrobe miscalculation’. 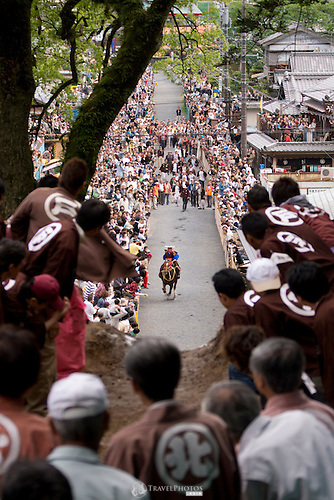 The Tado horse festival is an annual religious event held at a Shinto Shrine. The basics are that a drunken horse is ridden up a drunken steep slope by a drunken rider. Seriously, they get the horse drunk, the rider is drunk, and they splash copious amounts of sake (Japanese rice wine-like alcohol) on the slope and obstacle. If the horse and rider make it over the slope, then that heralds a good rice harvest later in the year. Accurate information on this event is hard to gather, as each person can tell you a fragment of what they know of this event, and sometimes these fragments contradict what other people have said. But from what I think I can reliably gather is this. For a couple of weeks before the event, the riders are kept in a kind of religious quarantine. They are fed traditional food, partake in specialised religious ceremonies, and are taken care of before the event. Everything is provided for them, and everything they need is given to them. 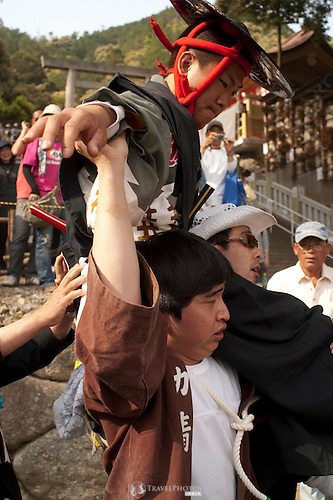 Even during the event, it appears their feet are not permitted to touch the ground and so the riders need to be carried either by horse or by human, otherwise they are permitted to stand on tatami mats or rocks. The slope is rather steep, and has an added mound-obstacle at the top with a bamboo pole sticking out. At about midday the mound is ceremoniously broken making a small gap for horse and rider to attempt their climb over. The horse is raced down a long straight gaining momentum that should assist it to get up and over the mound. For each horse and rider, there is a dedicated team of mostly young (brave) men who stand in file either-side of the path to guide the horse to the break in the mound and help the horse and rider over. As you’re probably beginning to imagine, it is dangerous. Last year I saw a guy carried away on a stretcher with blood coming from his head. No blood this year, but there were several casualties taken away by ambulance. There was a dedicated doctor on site who did need to attend to a few people. The event today drew a crowd of approximately 100,000 people. 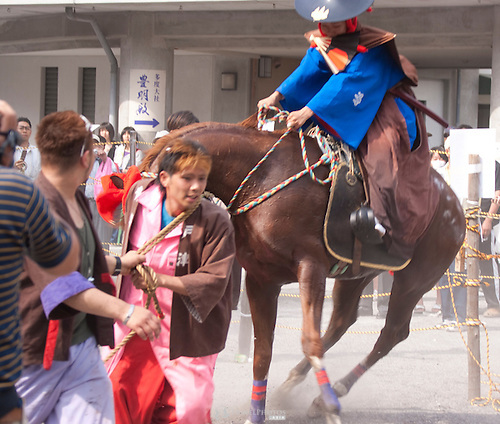 The Tado Horse Festival often attracts crowds of about 80,000 to 90,000 people over the Tuesday and Wednesday of the Golden Week holiday at the start of May. Animal rights groups do campaign against this event, as horses can get injured (and possibly later put down), and the horses are made drunk for this event. However, this event is far, far older than the notion of animal rights. The owners of the horses attend the event, and the horses are probably re-used and needed for the second day of the event. 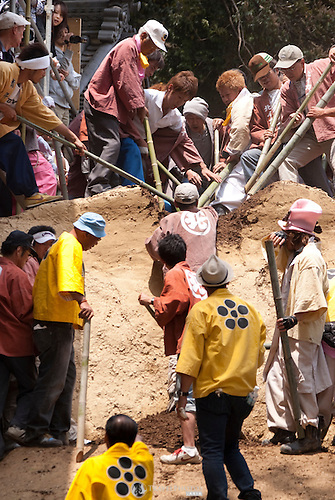 There are apparently other similar events in Japan which reportedly have as a compromise lowered the mound to make it easier and less risky for horses. Furthermore, why should animal rights groups call for the cancellation of a centuries all event? To demand an end to such a cultural event in any Asian country, by those influenced by Western values would seem a little culturally-imperialistic. Moral relativists would be saddened to see a cultural event cancelled to please a few people, but would rather let the Japanese decide for themselves what is appropriate for their culture. There are opposing views of this event, and they all have valid arguments, as you can see. So, what’s my position really? I cannot pass judgement. From Nagoya Station, take the Kintetsu Express train to Kuwana Station (about 30 minutes) with a ¥440 ticket. 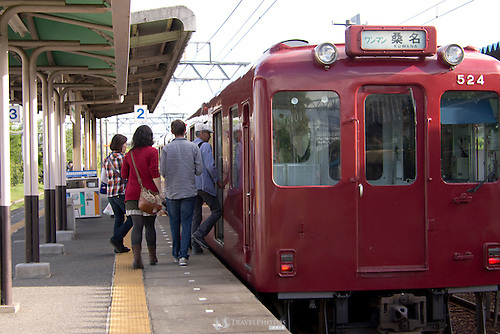 On the same platform you get off at, is a connection to the Yoro Tetsu train company. There will be a little table there selling tickets (specifiy “return”) for about ¥310. From that Kuwana platform to the Tado station, it will take about approximately 13 minutes. Just follow the crowd for a 10 to 15 minute walk up the gentle slope through the town and along the river. Ticket prices may be updated without notice. Check Hyperdia.Com for train times and prices. These images are available at both Asia Photo Connection (aka Henry Westheim), and my portfolio at PhotoShelter > Tado Horse Festival.